The fennel bulb is a well known food while the seed is a wide ranging medicine. The root, leaf and flower are also medicinal but less commonly used. As a carminative, fennel is extremely useful as a digestive aid, decreasing flatulence, promoting digestion, and regulating the appetite. Fennel is antispasmodic and specifically called for with colic, especially in infants. Fennel is an antiacid, helping to neutralize excess acids in the stomach and intestines as well as clearing uric acid from the joints. This lends to its use for kidney stones and gout. Fennel benefits the female reproductive system, increasing lactation, reducing morning sickness during pregnancy and an aid for deficient menstruation. In her book Herbal Recipes for Vibrant Health, Rosemary Gladstar suggests 2-4 cups daily to increase and enrich milk flow while nursing. A warm tea of fennel seed can be used as a wash for conjunctivitis and other eye inflammations. 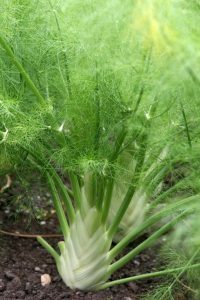 According to Matthew Wood, fennel thins unhealthy mucus while improving secretion and health of fluids, therefore a beneficial medicine for the lungs. The seed can be eaten raw, made as a tea or tincture. Fennel seed can be made into a tincture or tea. It is part of a traditional Ayurvedic digestive tea: equal parts fennel seed, cumin seed and coriander seed. Bring to a boil and allow to simmer for ten to fifteen minutes. Drink throughout the day as a preventive medicine for balancing the digestive system or in an acute situation. Helps reduces flatulence. 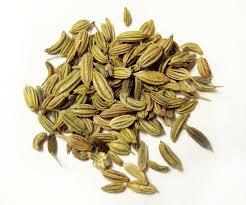 Fennel seed is a popular spice for cooking. Add to meat and chicken dishes, potatoes and squashes or in a dipping oil for breads. Cautions/Contraindications: Possibly estrogenic, take caution with estrogen sensitive women.